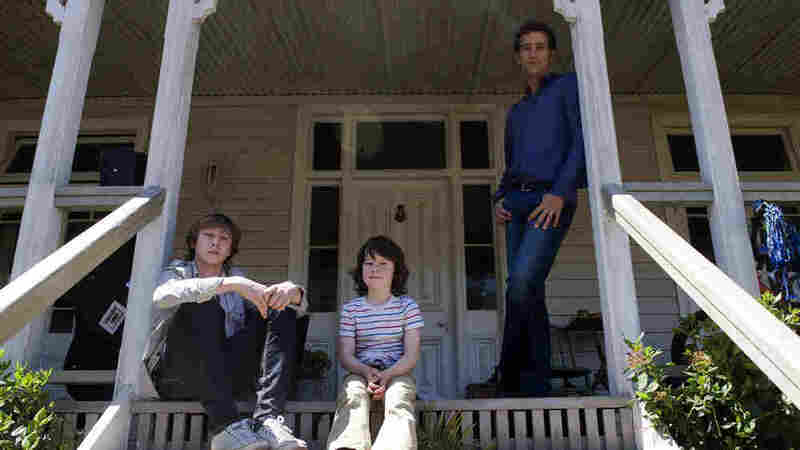 Movie Review - The Boys Are Back - A Down-Under Tale, With A Trio Of Grieving Lost Boys After a sportswriter (Clive Owen) loses his wife, he and his two sons go through a painful process to become a family again. Unfortunately, says critic Mark Jenkins, director Scott Hicks spends more time on cinematography than characters in The Boys Are Back. Tough-skinned action star Clive Owen tries a little tenderness in The Boys Are Back, the saga of a widower and his two young sons. Despite some awkward episodes, the family eventually flourishes. But the movie itself never quite blooms. Very loosely derived from Simon Carr's memoir, the story centers on Joe Warr (Owen), a sportswriter who left his native Britain — and his wife — to marry an Australian. He and Katy (Laura Fraser) have a 6-year-old son, Artie (Nicholas McAnulty), and a rustic spread on the south Australian coast. Barely acknowledged at first is Joe's older son, Harry (George MacKay), a teenager who's gloomily enduring the same British prep school his father hated a generation before. Joe's Down Under idyll ends when Katy collapses at a party and is revealed to have advanced abdominal cancer. Soon, Joe and Artie are alone. The boy's response is to pose too-precious questions and throw the occasional tantrum. His father copes by drinking too much and turning the family home into an anything-goes clubhouse. Pillow fighting, water-balloon contests and risky car rides are all on the agenda. Meanwhile, greasy dishes and unwashed clothes pile up. A few women try to intervene. Joe's mother-in-law protests that her grandson needs structure. The mother of one of Artie's classmates, smitten with Joe, watches the boy after school. And Katy herself makes the occasional appearance, offering gentle, indulgent advice from beyond the grave. It's easy to see why director Scott Hicks wanted to include more of Katy, but flashbacks would have been a better choice than ghostly visitations. His wife's continued presence makes Joe's grief seem less rather than more real. Ultimately, it's not the women who transform Joe and Artie's bachelor party. It's Harry, who arrives from Britain with more than carry-on baggage. He resents his father for abandoning him, yet soon bonds with his little half-brother. Harry might stay for good, except for an ugly incident after Joe's boss orders him to Melbourne to cover a tennis match. Joe can't get anyone to watch the boys, and Harry insists they'll be all right alone. They aren't. Dramatically, this crisis is essential to the movie's structure. But Joe's inability to hire a babysitter doesn't make sense. As is usually the case in these sorts of upper-upper-middle-class tales, money is never an issue. Joe buys full-price plane tickets from Australia to London without flinching, and purchases a flashy new car when his ghost wife suggests it. So paying — even overpaying — for emergency child care shouldn't be a problem. In his first Australian production since Shine, Hicks emphasizes scenery over psychology. Kangaroos cavort in the backyard, the sun glints on the open sea and Icelandic art-rock band Sigur Ros fills the air with cloudlike melodies. The effect is weirdly lulling. Viewers with a special connection to this story, or a weakness for little boys and single dads, may find The Boys Are Back moving. For everyone else, the movie is merely picturesque.